But creating habits is easier said than done. Though I’ve written extensively about behavior engineeringand the importance of habitsto the future of the web, few resources give entrepreneurs the tools they need to design and measure user habits. It’s not that these techniques don’t exist — in fact, they’re quite familiar to people in all the companies named above. However, to the new entrepreneur, they largely remain a mystery. Habit Testing fits hand-in-glove with the build, measure, learn methodology espoused by the lean startup movementand offers a new way to make data actionable. 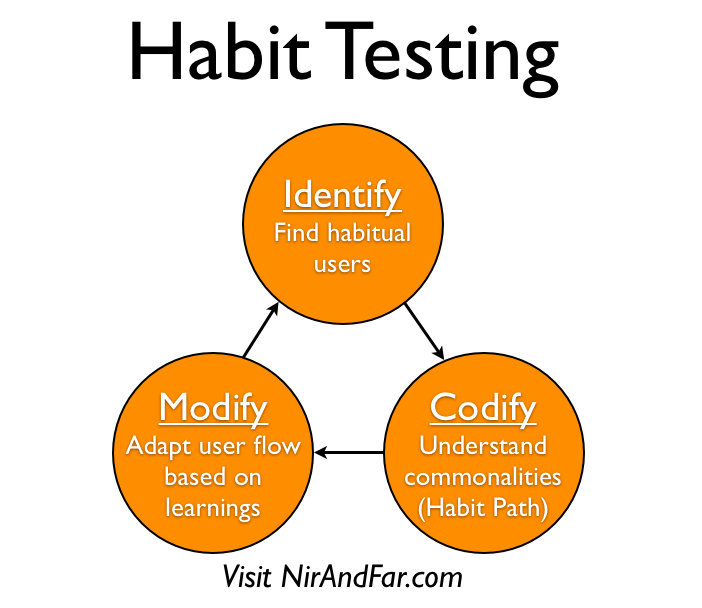 Habit Testing helps clarify three things: 1) who your devotees are; 2) what part of your product is habit forming, if any; and 3) why those aspects of your product are habit forming. A prerequisite to Habit Testing is having some kind of product up and running. Of course, before launching even a minimal viable product, it’s a good idea to take a stab at your business modelhypotheses and how your product will create user desire. Once you have a site or app live, you can begin collecting data. Habit Testing does not necessitate collecting data about everything — just the right things — so setting up the appropriate analytics is critical. In order for Habit Testing to be successful, you need to date stamp the path users take while using your site.